Dipped in batter and fried these fresh peaches are amazingly delicious. 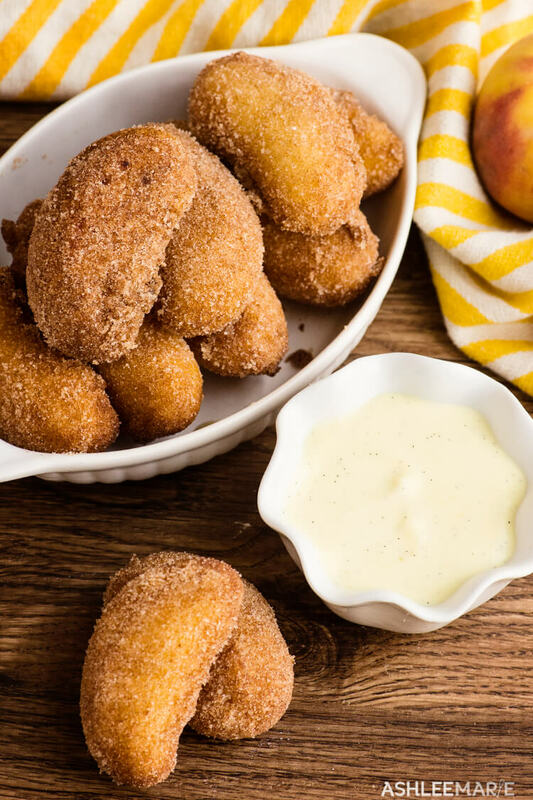 Cover the fried peaches in cinnamon and sugar and served with from scratch vanilla bean creme anglaise sauce this fair food favorite is amazingly delicious. Kay – this is where I admit I’m not the biggest fan of peaches. BUT my kids are. 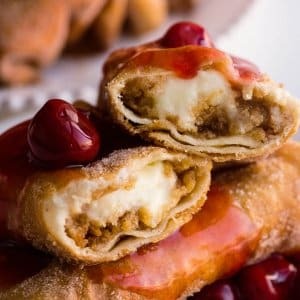 Something I AM a fan of is fried treats! I never miss the fair and spend almost all my day enjoying all the fair food I can eat. 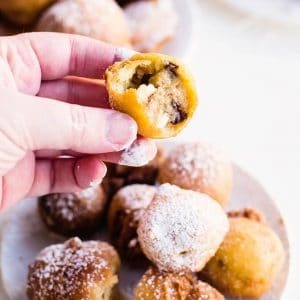 I have Deep fried Twinkies, oreos, cookie dough and snickers on the blog already. 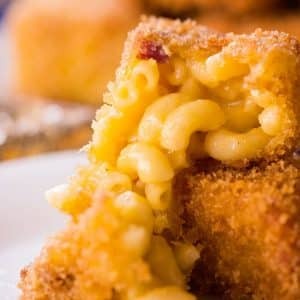 What is your favorite fair food? I need more to make this year!!! Anyway If it say “fried” on the banner you know I’m stopping. 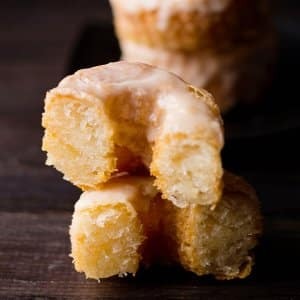 Now when I first tried these they were served with whipped cream. But I didn’t feel that was the best fit… Then last month I was at Disneyland and they served the Mickey Beignets with some vanilla bean creme anglaise sauce and I fell in love and thought “this would be PERFECT” and not to toot my own horn, but I was right, this sauce is AMAZING with these fried peaches! 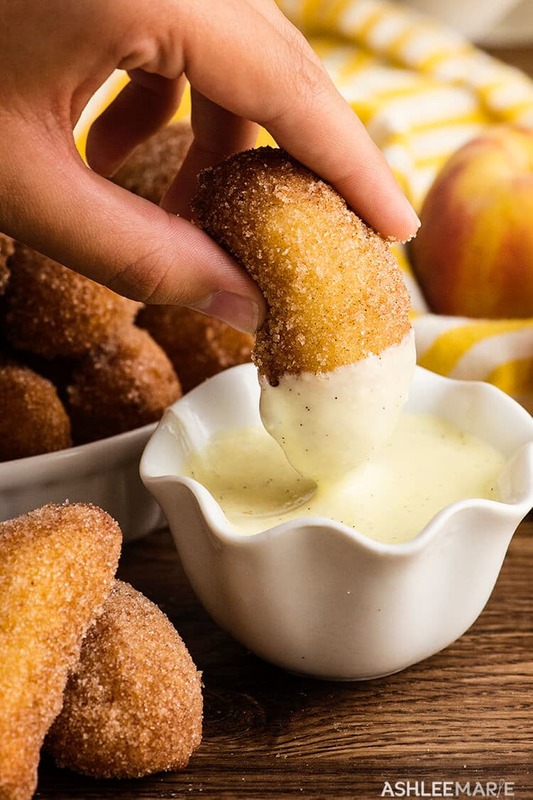 Just take me to the Fried Peaches Recipe already! 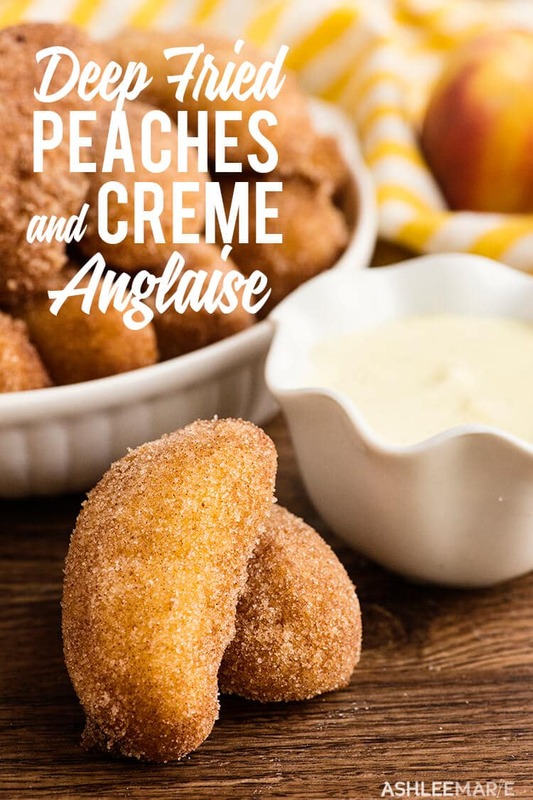 If you’d rather skip my tips and tricks for getting perfect Creme Anglaise sauce and fried peaches, along with links to other fried recipes and get straight to this delicious battered deep fried peaches – simply scroll to the bottom of the page where you can find the printable recipe card. 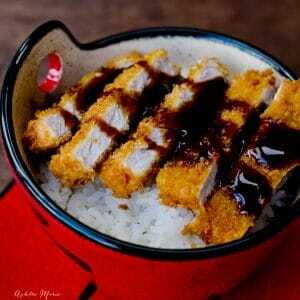 or an electric skillet – it also holds oil at the perfect temp but it’s not as deep so it’s not great for all fried food you might want to make. or a pot with a good thermometer. It takes a little more effort to keep the oil at the right temp – you’ll have to babysit it and constantly tweek but you can control the depth and everyone has a pan lying around, right? pick the right oil! there are a lot of options out there, and not one oil is good for everything. Olive oil is more sensitive to heat so it’s not right for deep frying. There is peanut oil, coconut oil, canola oil, vegetable oil, lard…. think about what your making and the flavor the oil you pick will add to your dish. I stuck with a simple vegetable oil for this but feel free to experiment! Have a jelly roll pan with a few layers of news paper, and then paper towels and then a cooling rack on top ready to go before you start frying. The peaches don’t take long to fry and you want to be ready to take them out right away so they don’t over cook and you can take them out immediately. You can just put it on the paper towels but the cooling rack will keep it crisp vs sitting on the oil and staying oily. in fact have everything ready to go before you start frying – the batter, the peaches, the cinnamon and sugar and the chilled sauce. fried peaches are best fresh so go ahead and prep everything ahead of time but wait to fry them until your ready to enjoy them! I like to use an actual vanilla pod but you can use vanilla bean paste or vanilla. I like to beat my eggs and sugar together getting a lovely thick base. But you can just beat the eggs alone and dissolve the sugar with the liquid. It’s a personal choice. I feel it actually thickens faster this way but maybe that’s just in my head. have the eggs beat and ready to go before you heat the liquid, you don’t want the liquid to get too warm or simmer too long so you want to be ready for the next step. Obviously I keep repeating to prep – so here I go again – have the ice bath ready to go so the moment the sauce is thick enough. Since you need to be stirring constantly you don’t won’t be able to prepare it in the middle of cooking the sauce. The ice bath will chill the sauce quickly. If you put the warm sauce directly into the fridge you’ll warm the other foods and create a lot of condensation into the sauce. 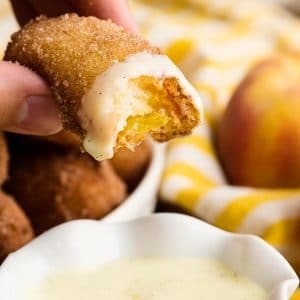 If you love these fried peaches with vanilla bean creme angalise sauce as much as we do, please leave a 5 star review and be sure to share on Facebook and Pinterest! If you want to stay updated on new recipes sign up for my newsletter and join my Facebook Group! 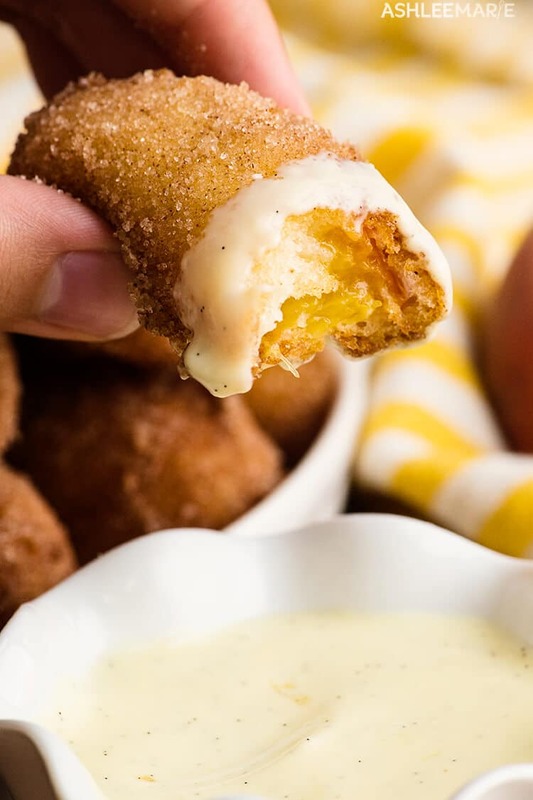 If you love fried treats you’ll love these other fried food recipes! In another bowl whisk the egg yolks and sugar together until they are light in color and ribbony. And today happens to be national Peach day!!! What’s your all time favorite recipe to make with peaches??? 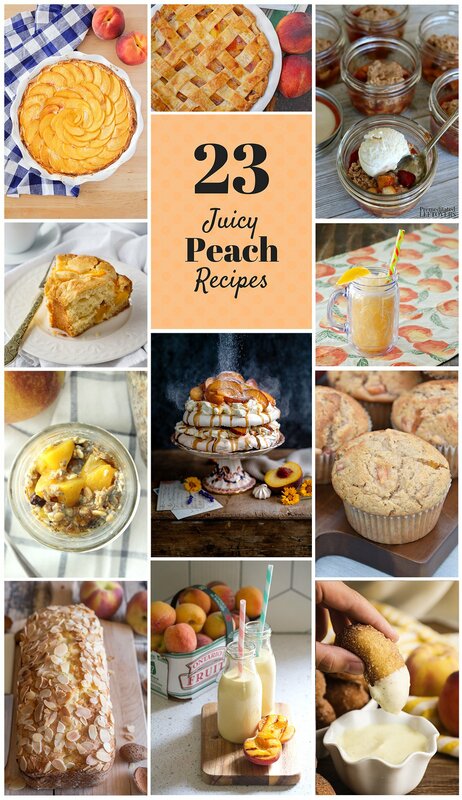 I have 22 more Peach recipes to share with you that I just know your going to love!